Do you want to know the benefits of spinach? Spinach is one of the top 10 healthy vegetables that you can eat. This wonder green leafy vegetable can be eaten in many different ways but to enjoy it's maximum nutritional value, it should be consumed fresh (juice), steamed, or quickly boiled. Apart from being a rich source of many vitamins like A, B, C, E and K, spinach is also rich in many essential minerals like manganese, magnesium, iron, calcium and potassium. Additionally it is known to be a good source of omega-3 fatty acids, niacin and selenium. It's benefits have been well known for a long time. Although, with researches happening frequently, more benefits as well as drawbacks are being discovered. In World war I, the french soldiers were said to be given spinach juice mixed with wine, to help the blood loss due to injuries. Remember how Popeye made himself super strong by eating tins of spinach? Popeye surely knew about the health benefits of spinach. So let us have a look at benefits of spinach and a few drawbacks of eating spinach. How you can buy and store it and what different recipes you can make with it, to incorporate this healthy vegetable in your diet. * Spinach falls under the category of protective food group. In fact all vegetables and fruits that are rich in beta -carotene and ascorbic acid, fall in this category as well. you might ask, "why the name protective?". The reason is that beta-carotene (which is converted into vitamin A) and ascorbic acid (vitamin C) help support the body's resistance and protect against infection and ailments. * Spinach is an extremely powerful antioxidant. It contains 4 times more beta-carotene and 3 times more lutein than broccoli. Hence, it helps in destroying the free radicals in the body and thus prevents against cancer. It is rich in fibre that helps lower the blood cholesterol. * Consumption of spinach and other leafy greens may help in curing depression. The reason being high levels of folic acid present in spinach. It is proven that folic acid deficiency can cause severe depression, irritability, forgetfulness and even insomnia. Spinach and other greens can help in raising the folic acid level in a natural way. * Spinach juice has the ability to reduce pain. The anti-inflammatory properties of greens can help in reducing pains in arthritis and other rheumatic conditions. Mix spinach juice with the juice of carrot, beetroot and celery, is a remedy for pain relief in arthritis. The alkalinity of this juice dissolves the deposits around the joints to reduce pain and swelling . * Spinach juice is a natural diuretic. Spinach juice mixed with tender coconut water can be given during bladder infections to increase the urine formation. * Drinking spinach juice twice a day may help in correcting the power of the eyes. A friend of mine once did that and in one month, she no longer needed spectacles. As with most foods even spinach comes with a few drawbacks. Due to the presence of oxalates in spinach, people with existing kidney stones or gallbladder stone problems should avoid eating spinach. Due to the presence of goitrogens in spinach, people with thyroid problems should also spinach. 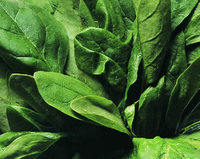 Choose fresh green spinach leaves that are vibrant deep green in color. Discard any yellow, wilted and slimy leaves. Wash them properly to get rid of any grit and dirt, before cooking. If not cooking immediately, spinach can be stored in a plastic bag (loosely packed) and kept the refrigerator for 2-3 days. Depending on the climatic conditions even up to 5 days. Do not wash it before storing as the moisture will spoil the leaves. Before putting in a plastic bag you may even wrap up the spinach leaves in a kitchen paper (loosely), so that any moisture is absorbed by the paper. Blanch the spinach by putting the leaves in boiling water for just 30 seconds until just wilted, take out and dip in cold water. Put in a freezer container. Deep freeze until ready to be used. Store up to 2 months. Thaw before using and chop when still frozen (as the knife blade will run through the frozen spinach much easily as opposed to when completely thaw). Now that you know about the benefits of spinach, let us see how you can incorporate it in your diet. Here are some spinach recipes for you to try.